Why I stopped watching football. This fall, for the first time I can remember, I won’t be watching football. I’m going to miss it. I’m going to miss sack dances and perfect spirals; leggy cheerleaders in long boots and creeping stadium shadows in the late afternoon; self-serious, mansplainin’ studio analysts and the flexing, glowering Fox football robot. I’m going to miss thrilling to Tim Tebow’s game-winning overtime touchdown toss in last year’s playoffs; I’m going to miss giggling at, like, 75 percent of his other passes. Mostly, I’ll miss the escape. Life is tedious. Life is hard. Life is bills and work and getting stuck in traffic. More than other sports, football provides an alternate universe, almost perfectly self-contained, a refuge from what Marxist historian and West Indies cricket writer C.L.R. James once called “the sordid compromises of everyday existence.” Tune in, turn on, set your fantasy lineup, drop out. Like a soap opera, football’s weekly narratives are both engrossing and inexhaustible; like reality TV, nothing about the sport seems quite real. Not even its inherent violence. I mean, everyone knows that football physically destroys its participants from the outside in -- breaking bones, smashing shoulders, shredding ligaments. It’s just that no one really cares. We feel sympathy, not empathy. We’ve made our peace, the way we’ve made our peace with all of the terrible things horse jockeys and runway models do to their bodies in order to stay thin. A football player goes down, writhing in pain. A trainer jogs in from the sideline. Cut to commercial. The end. The entire scene is routine, mundane, packs as much emotional punch as the arrival of the old “Madden NFL” ambulance. Oh, well. Price of admission. This isn’t flag football. Don’t want to get hurt? Go play intramurals, brother! Brain damage destroys lives from the inside out. Destroys not only what people can do, but also who they are, now and forever. The harm is usually invisible, like an IED buried inside the skull, until it becomes plain. I can’t make peace with it. For much of the past two years, I’ve been reporting and writing on football’s concussion crisis -- which is less a crisis than an everyday state of affairs, and hardly limited to concussions. 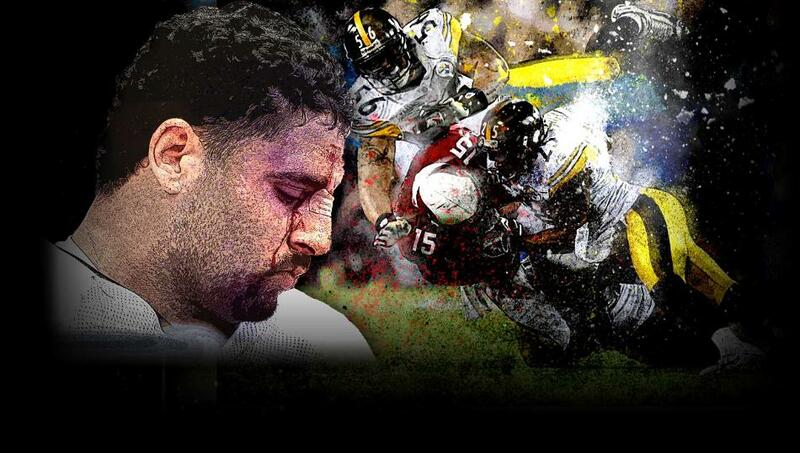 (Big hits, little hits: They’re all an unavoidable part of football, and they all add up). I’ve met parents mourning the death of their teenage son; former players who get lost driving around their own neighborhoods; scientists describing in microscopic detail how proud, intelligent men become hollow, half-mad husks. I’ve learned that the NFL can be callous, and fans even more so, and that for many people, ignorance is bliss, even when it involves the health of their own children. Slowly, over time, I’ve found myself worrying more and enjoying football less; recently, I’ve come to feel that seeing people ruin themselves for entertainment’s sake -- so my Saturdays and Sundays are a little more fun -- isn’t just sordid. It’s ghoulish. For me, at least, there is no more escape. I can’t watch football because of Ann McKee. We met in the morgue, at a VA facility outside Boston, where the brains come, freezers and refrigerators ringing a steel table, as clean and cold as the nearby scalpels. McKee wore surgical gloves and a blue plastic bib. She held a white plastic bin. Inside was a human brain, immersed in preservative fluid, yellow-green and translucent. It looked pickled. Another bin. Another former pro. McKee was speaking as a research scientist. As a football fan -- as the kid sister of two brothers who played the sport -- she knows the larger truth. There are no good cases. A neuropathologist and co-director of the Boston University Center for the Study of Traumatic Encephalopathy, she started off years ago looking at the brains of punch-drunk boxers, slides of stained neural tissue placed under microscopes, the last, silent testaments of men who died young and troubled. Her first football brain was a revelation. Other organs can be transplanted and replaced. Our brains cannot. They are us. Our thoughts, feelings, sensations, reflexes. Football hits cause trauma, pulling the brain like silly putty, stretching and shearing nerve cells. Some hits cause concussions. Some do not. The damage accumulates over time, regardless: Boston University researchers estimate that the average high school lineman takes between 1,000 to 1,500 hits to the head each season, some at forces equivalent to or greater than a 25-mile-an-hour car crash. The end result can be found in the white plastic bins, and in McKee’s office, where stacks of slides are piled like freshly-folded laundry. Former Philadelphia Eagles safety Andre Waters, dead at 44 from shooting himself. Former University of Pennsylvania football captain Owen Thomas, dead at 21 from hanging himself. Former NFL safety Dave Duerson, dead at 50 from shooting himself – purposely in the chest, so that his brain could come here. Because the brain floats inside the skull, there is no magic helmet that will make football safe. Smack an egg carton with a baseball bat: Would bulletproof Kevlar packaging keep the yolks from sloshing around? Currently, CTE can’t be detected in the living. Scientists are working on tests, biomarkers and brain scans, ones that don’t require scalpels. A diagnostic method is not forthcoming. As McKee puts it, the brain is deep space. While attending medical school, McKee suffered a bicycle accident, flipping over her handlebars. She hit her head. Some older women stopped to help. McKee told them she felt fine. She was fine. She got back on her bike. It was unrideable. She walked seven miles home, rolling her busted bike alongside. The next weekend, she took her bike to a repair shop. They told her it wasn’t broken. McKee was shocked. Unnerved. Football increasingly makes her feel the same way. She grew up rooting for the Green Bay Packers. She remains a devoted fan, has a framed 1968 team yearbook in her office. Recently, though, she stopped attending local high school games, something she once loved. McKee is a mother. The hits were too hard to stomach. Even watching the Packers makes her pause. I’m tired of holding mine. I can’t watch football because of Gil and Michelle Trenum. And because of their son, Austin. Two years ago, Austin suffered a concussion during a high school football game. An alert trainer pulled him off the field. Emergency room doctors checked him out. He went home. He seemed OK.
A day and a half later, he hanged himself. There was no suicide note. There were no warning signs. Austin had no deep, dark secrets. He was a happy, healthy kid. A good student. Popular and well-liked, the type of young man you hope your daughter brings home on prom night. He loved his parents, his girlfriend, his two younger brothers. He was planning to go to college; on the last day of his life, he was planning to watch a Washington Redskins game. The Boston center examined his brain. They did not find CTE. They did find a multifocal axonal injury, damage to the fibers than connect the brain’s nerve cells. Doctors strongly suspect the injury led to Austin’s sudden, inexplicable decision. His family was devastated. His friends, too. An entire community. Football went on. Gil and Michelle have since become advocates for concussion safety and awareness. Grieving parents seek them out, anguished phone calls and emails coming from people they’ve never met. I’ve written about the Trenums. I admire them. Consider them friends. They are the bravest people I know. Still, they hurt. They live with a hole. It will never be filled. Football damage is like a rock dropped in a lake. The human cost radiates outward, concentric circles of pain. Duerson. Ray Easterling. Junior Seau. Each man had a family. We all do. Loved ones suffer twice, in death and in life. These are the words McKee uses to describe the clinical symptoms of CTE: Impulsivity. Disinhibition. Volatility. Problems with depression and emotional control. And this how Hall-of-Fame lineman Mike Webster, later diagnosed with the disease, spent his final months on Earth: living in his truck, squeezing Super Glue on his rotting teeth, shooting himself with a Taser gun in order to sleep and sniffing ammonia to stay awake. Sometimes, Webster would call his friends and family, disoriented, needing directions to his own home. “All I see is trees,” he would say. I know a woman named Monet. Her father played in the NFL. Her cousins. Two of her brothers. One of them is having problems. Relationship issues. Bad decisions. Erratic behavior. He thinks he has CTE. His family agrees. They babysit him. At work. At youth football practice, where he’s a volunteer coach. They try to make sure he’s never alone. He has no clue. They don’t want to hurt his pride. I know another woman, the wife of a retired player. Her husband bounces checks. Can’t hold a job. Forgets to pay the same parking tickets a half-dozen times. At home, he will open the refrigerator, make a sandwich, and then place the leftover meat, cheese and condiments on top of the fridge. His wife cleans up the mess. She always does. She’s exhausted. She sometimes cries for hours. Everything keeps getting worse. This, too, is football. Just not the football they televise on weekend afternoons. The closest thing might be HBO’s “Hard Knocks,” which sometimes shows players at home -- eating dinner with their wives, playing in the pool with their children. The families are young. They always seem happy. I wonder if they know what might be coming, the scope and the magnitude. I wonder if they see Mike Webster’s trees. I can’t watch football because of my nephews. One is 23. He’s a smart kid, tall and handsome, just starting out in life. Maybe I’m biased, but he ought to go far. He played college football. He has the knees of a 50-year-old. I pray that’s the extent of his long-term damage. My other nephew is 14. He was the ring-bearer at my wedding. He’s one of the smaller kids on his youth team, yet somehow plays on the defensive line. He spends a lot of time getting pummeled. He recently told my wife that he has been concussed before, and that a lot of his teammates have, too; he said this matter-of-factly, with something approaching pride, as if brain trauma is both the natural order of things and the wristband that grants access to an exclusive, manly club. I wish I could be so blithe. Earlier this year, I met filmmaker Sean Pamphilon. You probably have heard of him. He’s the guy who released audio of former New Orleans Saints defensive coordinator Gregg Williams exhorting his charges to “kill the head” of opposing players. He also is the director of “The United States of Football,” an upcoming documentary that explores football’s place in American culture. The film is largely built around Pamphilon’s sprawling attempt to answer a single question: Should I let my son play football? Over lunch, Pamphilon told me he has been working on the project for more than two years, interviewing everyone from medical experts to Pittsburgh Steelers defensive linebacker James Harrison to the wives of dementia-addled former players. He told me that he still loves football, but can’t watch it the same way. He told me that he hopes his junior high-age son chooses not to play the sport when he gets older -- and that any parent who lets their child play tackle football without at least getting educated about concussions and brain trauma is essentially committing apathetic child abuse. Knowing what I know, it’s hard to argue his point. Biologically speaking, boys and young men are particularly vulnerable to football-induced head trauma. Their brains are still developing. At the same time, they are the least-protected players in the sport. Case in point: Last December, Cleveland Browns quarterback Colt McCoy was concussed on a brutal, helmet-to-face mask hit. A team trainer misdiagnosed the injury and allowed McCoy to continuing playing, putting the quarterback’s life at risk; afterward, the league placed certified athletic trainers in above-field press boxes to watch for missed concussions, while NFL Players' Association executive committee member Scott Fujita called for the sideline deployment of independent neurologists. Can high schools afford the same safeguards? Can Pop Warner leagues? I doubt it. According to the National Athletic Trainers’ Association, only 42 percent of high schools nationwide in 2010 even had access to a certified athletic trainer educated in concussion care. The studies are disturbing. The American Association of Neurological Surgeons reports that between 4 and 20 percent of college and high school football players will sustain a brain injury during the course of one season; many experts believe that number is wildly low due to undiagnosed and unreported concussions. A 2009 survey of high school trainers found that more than 40 percent of concussed athletes return to play too quickly, and that 16 percent of players who lost consciousness after being hit returned to the field the same day. Researchers at Purdue University recently found evidence of hit-induced brain changes in both concussed and non-concussed high school football players. A Virginia Tech study measuring head impacts among 7- and 8-year-old football players found that some hits generated more than 80 g’s of physical force -- equal to the blows delivered in college football. It took months for Drew to fully recover. Others aren’t as fortunate. I’ve been talking with a guy named Hank. He’s in his 30s, like me. Once, he was the captain of his high school football team; today, he suffers headaches and memory lapses. He’s worried about CTE, says some of his old teammates share the same problems, the same fears. He doesn’t want to publish his full name, not so long as prospective employers can use Google. … I remember my sophomore year, I began two-a-days practices with the varsity guys. I was a linebacker so they put me in hitting drills with the other linebackers. I was a 5'10, 165-pound, barely 16-year-old going up against 6'2, 225-pound 18-year-olds who were being scouted by colleges. One of our LB went to Hawaii on a scholarship, another to UC Berkley. One drill, I was supposed to tackle the senior starting center. He hit me so hard I couldn't see straight. I played inside linebacker sophomore year. After the season, I became very very depressed. I didn't know why. I figured it was just a part of being a teenager, you know, hormones and things. But I mean really depressed. I remember asking one of my defensive coaches for help, that I wasn't feeling well emotionally. He looked uncomfortable with the idea. He told me to get some exercise and that would fix me up. Head trauma never entered my mind. I couldn't fathom playing football had anything to do with my emotions. Dr. Robert Cantu, one of the nation’s leading sports concussion experts, argues in an upcoming book that children under 14 years of age shouldn’t play collision sports. When I spoke to Cantu this spring, he said that his recommendation likely would “piss some people off.” I’m sure it will. I’m also starting to wonder if Cantu goes far enough. College football is a multibillion-dollar, taxpayer-subsidized business. A Texas school district recently opened a $60 million prep football stadium. That’s a lot of public investment in head trauma. In a recent issue of Sports Illustrated, a youth football coach wrote that the only time he gets “questions about safety is when it’s a first-time kid and Mom is concerned about him playing tackle football. I tell parents that at six years old, they’re not tackling, they’re just pushing each other. If we get them at six and teach them how to play the game, when they’re 10 and 11 they’ll be a lot safer … a lot of parents are putting their kids in flag football leagues. Those parents are doing their kids a disservice.” I think that’s crazy. All of it. We’re not talking about adults. We’re talking about children. Pee-wee leagues and high schools and colleges alike act en loco parentis. Their first duty is to keep kids safe. To cultivate young minds, not destroy them. Recently, I’ve been asking people: Would you support high school boxing teams? College scholarships for MMA? Of course not, they say. Then how can you support football? People look at me like I’m crazy. I can’t watch football because of Linda Sanchez. She’s a congresswoman from California, a member of the House Judiciary Committee. During a 2009 Capitol Hill hearing on concussions in football, with NFL commissioner Roger Goodell slouching meekly in his seat, she likened the league to the tobacco industry. Goldberg: Is there any evidence, as far as you're concerned, that links multiple head injuries among pro football players with depression? Goldberg: With early onset of Alzheimer's? Goldberg: Is there any evidence as of today that links multiple head injuries with any long-term problem like that? Getting hit in the head is bad for you? Duh! Those money-grubbing, ambulance-chasing ex-players knew what they were getting into. Now they’re complaining? Tough luck. Why can’t they just leave football alone? OK, fine. They didn’t know. Today’s players do. And guys like Troy Polamalu are fine with the risk, cool with harming themselves. Who am I to feel differently? As the writer Charles Pierce put it in his piece on Grantland, “We ought not to allow people to be destroyed -- either all at once, or one concussion at a time -- for our amusement. Doing so makes us amoral. Hell, it makes us vampires.” I think that’s about right. Football is culturally irreplaceable. It teaches important, lifelong values, like teamwork and self-sacrifice. It satisfies our deep, dark bloodlust. It gives young men an outlet for aggressive impulses. Non-contact sports teach the same thing. Working at an after-school job teaches the same thing. For bloodlust, we have Hollywood and “The Real Housewives” franchise; for channeling young male aggression, we have “Call of Duty.” None of the preceding involve brain trauma. Hey, you can suffer a concussion driving a car. Or riding a bike. Life is risky. Football is risky. Sure, we should minimize the risk. But doing so is enough to keep on enjoying the sport, right? Accidents are tragic. But they happen. True. Only here’s the thing about football, the thing that separates it from everything else, that makes the sport exciting and dangerous and fun, the thing that's so hard for me to reconcile. The hits aren’t accidents. They’re pretty much the point. I’m going to miss football. I already miss enjoying it. Sure, I’ll still follow the sport -- a highlight here, an article there, a check of the stats and standings. And yes, I’ll still write about it, too. It has that kind of gravitational pull. I don’t begrudge anyone who feels differently, nor judge anyone who wants to sack out on a Sunday afternoon, lost on Planet RedZone. All of us are informed by different experiences. Mine have brought me here. It’s a pretty lonely place. Football’s popularity seems to grow every year. I wonder how long that will last. A few weeks ago, my colleague Will Leitch asked in the pages of New York magazine if following football was morally wrong, concluding that “there are no big TV contracts or player salaries without fans tuning in. We’re all part of the problem.” Are we? Am I? I can’t say. I only know this: There’s definitely a problem, an ugly one, and I’ve seen too much of it to keep watching.